Chicago is a long way away from Utuado and Yabucoa, Puerto Rico. But Julian Seda is trying to get 68,000 pounds of donated supplies to these and other remote towns, as fast as he can -- and with as little official involvement as possible. "The government has their hands full," said Seda, who leads the Chicago chapter of a group called Puerto Rico Rising that formed after Hurricane Maria devastated the island. Instead of raising money for the Red Cross or requesting help from the National Guard, the group found a private shipping company with operations in Chicago and Puerto Rico willing to ferry donations by boat for free to warehouses it owns on the island. The organization, which is currently in the process of obtaining non-profit status, then distributes the supplies. That way, it avoids the government inspections at the port and "all the bureaucracy that has become a bottleneck," Seda said. Nevertheless, the ad hoc group's capacity to bring relief is limited; it has stopped collecting donations until it finds a way to transport the next load. Seda's group is one of dozens of organizations that are running into enormous logistical hurdles while trying to help Puerto Rico. 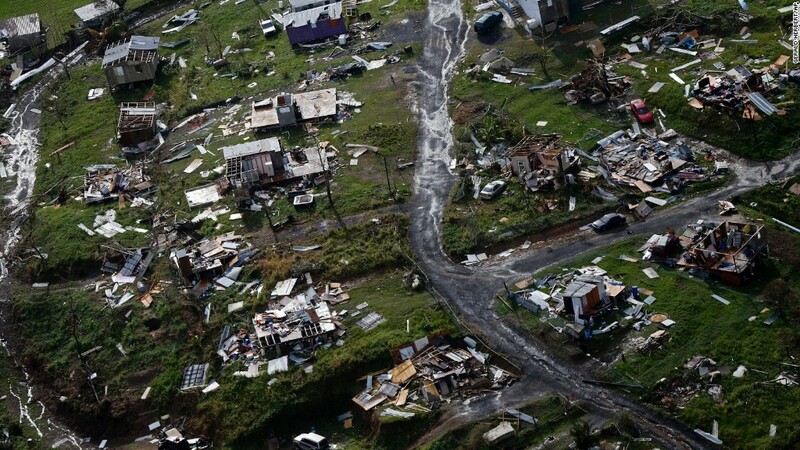 Disaster management experts say that the citizen response has been extraordinary, as Puerto Rico's diaspora of nearly 5.4 million watch in frustration while relief workers struggle to move supplies like food, water and medicine to those in need throughout the island. Transporting goods from church basements and high school auditoriums to an island more than 1,000 miles off the U.S. coastline, with already crumbling infrastructure and little to no cell service, has proven to be a major challenge. Puerto Rican leaders say they haven't gotten enough help from the federal and state governments, which have assets like planes and personnel that could be used to deliver aid. Transportation companies have made in-kind donations and big names like Broadway star Lin-Manuel Miranda have funded charter flights. But the need is far from satisfied. Meanwhile, volunteers say, the slow speed of road clearing and power restoration have made it more difficult to reach remote communities. There are currently 13,600 active duty and National Guard troops on the island, but many say that's not enough. "It shouldn't be up to the handful of Puerto Rican millionaires in this country to be the U.S. Air Force and FEMA," said Ohio state Rep. Dan Ramos, who represents the heavily Puerto Rican town of Lorain. Organizers of the New York Puerto Rican Day Parade received semi trucks full of food, water and clothing from other parade organizations in places like Hartford and Cleveland. But they sat in warehouses, until leaders could arrange transportation. "It has been a yeoman's task to figure this out," said Lorraine Cortes Vasquez, who chairs the New York parade's board of directors. Finally, she said, the National Guard took their first shipment, and JetBlue took some of their supplies as well. Experts typically recommend that people who want to help during disasters send money, which can then be used to buy and transport supplies from points closer to people who need them. But once goods have been collected, nobody wants to waste them. Miami nightlife impresario Michael Capponi runs the Global Empowerment Mission, which started after the 2010 earthquake in Haiti. After Maria, the group coordinated some 50 flights chartered by celebrities like Will Smith and reality TV personality Bethenny Frankel. They've procured a 100,000 square foot warehouse to store and sort 15 million pounds of donations, some of which had to be retrieved from small-scale drives all over the country. Capponi acknowledged that it would be "100 percent more efficient" to raise money than collect physical goods. Later on, money can also be used to buy goods in the disaster zone, which puts money back into the local economy. "The problem is," Capponi said, "we can't let all that stuff sit in the U.S." So, he continues to send trucks to pick it up. Still, some groups are bypassing the messy process of taking physical donations entirely. PRxPR, a group formed by Puerto Rican business leaders, has raised $530,000 to date. It has been parceling out small grants to individuals and organizations on the island for urgent priorities like generators and water filters, if they can be found in stores. But distributing those goods to the people who need them remains difficult. 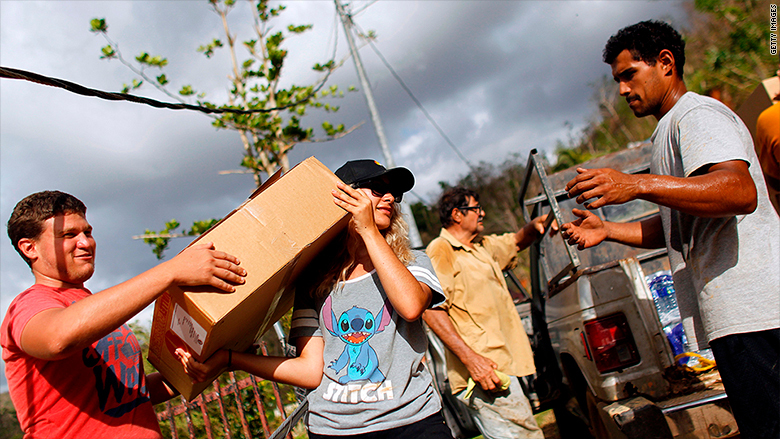 "You get a private cargo plane landing in the Aguadilla airport, and when that plane lands, is that there's not enough personnel to help unload the plane," said PRxPR co-founder Carmen Baez of the groups flying aid in. "There's not enough personnel to guard the merchandise, to load the trucks, to drive the trucks to where they're needed." This was a particular problem at the Port of San Juan, where pallets of aid sat uncollected for days, in large part because drivers couldn't make the journey to pick up supplies. Puerto Rican groups with local ties had an easier time. Puerto Rican Agenda, a 22-year-old community organization in Chicago, flew aid into Puerto Rico using two planes donated by United. Omar Torres-Kortright, a member of the group, says local politicians like San Juan Mayor Carmen Yulin Cruz helped make sure transportation was available at the airport and paperwork didn't hold anything up. "As long as our shipments are directed to municipal leaders like her, we do cut through the red tape," said Torres-Kortright. "The mayor of San Juan goes directly to the airport with her trucks, says 'That's my plane, it's my stuff,' and distributes it." The groups that have mobilized in the wake of Maria know their efforts won't be enough — so they're pushing for policy measures, like forgiveness of the island's enormous debt, and an exemption from the Jones Act, which only permits shipping to the island from other U.S. ports to be carried out by U.S. vessels. Javier Ferrer, who runs Houston's Puerto Rican and Cuban Festival, says that a Norwegian company offered to send a ship from New Orleans to San Juan with 53 containers of aid a few days after the storm. But by the time the White House announced a 10-day break in enforcement of the Jones Act, it would have been too late to get the ship loaded and out to the island. "That law needs to be lifted -- not temporarily, but permanently," Ferrer said. The Hispanic Federation, which has raised more than $14 million for Puerto Rico and is still chartering planes to send aid, is ramping up calls for a more robust effort from Washington. "It's been tremendously frustrating, to say the least, to see the lack of adequate response from our federal government," said Hispanic Federation president Jose Calderon. "There's only so much that the diaspora can do."